Today in Masonic History we discuss Hermetic Order of the Golden Dawn. The Hermetic Order of the Golden Dawn is a non-masonic organization which formed in the 19th century and is often associated with Freemasonry. 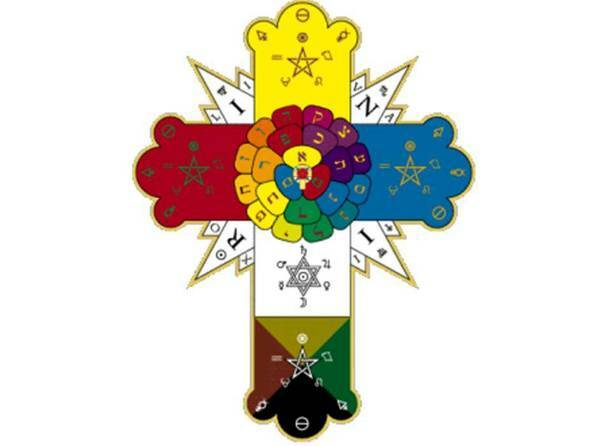 The Hermetic Order of the Golden Dawn, hereafter referred to as "the Order", was developed in the late 19th century with the discovery of the Cipher Manuscripts. The Cipher Manuscripts were passed between several masonic scholars until William Wynn Westcott was able to decode them in 1887. Westcott shared the Cipher Manuscripts with fellow mason Samuel Liddell MacGregor Mathers for a second opinion. Mathers in turn shared the findings with another mason William Robert Woodman. Mathers and Westcott are credited with developing the decoding of the Cipher Manuscripts into a usable format. Within the Cipher Manuscripts Westcott found the name and address of Anna Sprengel, a woman living in Germany. Westcott made contact with Sprengel who claimed to be in contact with the Secret Chiefs, beings who are responsible for overseeing all matters pertaining to esoteric organizations. Westcott asked Sprengel for permission to form a new temple in London, which Sprengel gave permission for and made Westcott, Mathers and Woodman members of the Order in 1887. It should be noted that there is some speculation that the Secret Chiefs, although often described as beings, are also believed to be books and materials containing esoteric knowledge. Although the founders of the Order were Freemasons, unlike Freemasonry and the Societas Rosicruciana in Anglia (S.R.I.A. ), the Order had no gender requirements or masonic affiliation requirements. Women were allowed into the Order on an equal standing with men. One of the members who joined during the Golden age of the Order in the mid-1890's was Florence Farr a popular actress at the time. She would become closely associated with Mathers until the two had a falling out over Aleister Crowley in the early 1900's. In 1896 or 1897, Westcott broke ties with the Order leaving Mathers in charge. It is unclear why Westcott left the order. It has been said that Westcott left documents concerning the order in a hansom cab. When his employer was informed, he was working as a coroner at the time, he was given the choice to leave the Order or resign from his job. No matter why Westcott left the organization, it was the beginnings of change in the order. By the early 1900's several temples of the Order had decided to declare their independence, generally unhappy with Mathers leadership. Similar to S.R.I.A there are three orders which make the Order of the Golden Dawn. Each order has degrees, or grades, inside the order. The first order, sometimes referred to as the Outer Order consists of six grades. The second order, which at one point was the ruling order of the Order of the Golden Dawn, has three grades. The final order has two grades. Some famous masons who were associated with the order were Aleister Crowley, Arthur Conan Doyle and A.E. Waite.